Carniny Rangers produced a stunning performance to book their place in the first final of the Ballymena Saturday Morning League season. Robert Young’s side thumped Ahoghill Thistle 4-0 - aided by a Dean Dunlop hat-trick - to reach the decider of the Mortgage Solutions Top Four final. There, they will meet old foes Harryville Homers, who accounted for Clough Rangers in the other semi-final. Ahoghill Thistle 0, Carniny Rangers 4: James Gracey in Thistle’s goal was first to be brought into action but he was unable to stop Dean Dunlop’s close range shot from opening the scoring. Carniny were giving the holders no time to settle and just after the quarter hour they doubled their lead. Frazer Young was given time and space to move forward on the right and his dipping shot was spilled by James Gracey to the grateful feet of Carniny debut boy Joey Nixon who netted from four yards. Though playing with the wind in the second half Carniny found themselves playing deeper as Thistle pushed forward in an effort to retrieve the game. Thistle went for all out attack sacrificing a defender and introducing Paul Aiken and George Courtney on the flanks and Emmanuel Okaikwai-Armah up front to add to the existing front two. Carniny stood firm though and on a breakaway Dean Dunlop managed to place a shot in the corner of the net from 12 yards out to put his team three up with 18 minutes to play. Thistle’s misery was compounded in the dying minutes when a clearance found Dean Dunlop thirty yards from goal. Spotting James Gracey off his line the big striker completed a memorable hat trick with an audacious chip over the keeper’s head to ensure Carniny’s place in the final. Harryville Homers 3, Clough Rangers 1: The opening goal came midway through the first half when Homers midfielder, Mark McKay, rifled in a twenty yarder off the underside of the bar to give his side the lead. Clough hauled themselves back on level terms ten minutes after the restart. They hit the Homers on the break with Gabriel Micatare finishing off Laird Law’s unselfish square ball from close range to make it one all. Clough were then reduced to ten men midway through the half and the Harryville side took advantage of the numerical advantage shortly afterwards when Darren Campbell was fouled in the box. David Nicholl coolly converted the resultant penalty to put the Homers back in front. Veteran Jason Stevenson rolled back the years to finish off the game as a contest. Stevenson when he picked up the ball on the wide edge of the box before cutting in and shooting low into the bottom opposite corner. 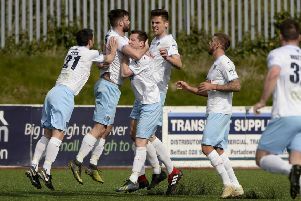 Abbeyview 3 Newpark Olympic 2: Newpark took control of the first half and they took and early lead when James Brown headed home a free kick from Ryan Carson. The newly promoted side were in confident mood now with James Brown a constant threat and he punished some slack defending in the View defence to make it 2-0 before the break. The second half saw Abbeyview stage a magnificent fight back. They cut the deficit to just one before the hour mark when Johnny Hunter headed his side back in the game at the back post after a great delivery from Roy Robinson. View drew level 20 minutes from time when the magnificent Luis Marcote skipped past four men before smashing the ball into the top corner of the net off the crossbar from 20 yards out. In the final 10 minutes Abbeyview completed the comeback and snatched all three points when Roy Robinson kept a cross alive in the box and he slipped the ball to Davy McWilliams to fire home and grab the bragging rights for Abbeyview in Antrim. Riverdale 0, All Saints OB 4: The deadlock was broken on 28 minutes when Philip Lynn fizzed a ball into Ryan Gregg who brilliantly flicked the ball into the path of Ryan Wilkinson to smash the ball home from 18 yards out. The half finished 2-0 to Saints when Barry Hamill broke down the left and drilled across the box Philip Lynn stepped over it and Stephen Sexton fired home from close range. The game was killed as a contest with 25 minutes to go when Philip Lynn crossed to the back post for Gordy Dillon who laid the ball off for Barry Hamill to smash into the bottom corner from 20 yards. Saints kept up their record of scoring four goals in every competitive game so far when Ryan Wilkinson slipped in Gavin Burnside to complete the scoring. Ahoghill Rovers 2, FC Penarol 1: After a scoreless first half, Rovers were awarded a penalty after Martin Millar brought down Alan Jones. David Chesney stepped up, going for power he blasted the ball over the bar. The deadlock was broken just after the hour mark when Rovers were awarded a free kick on the left, David Chesney delivered a great ball to the back post where Lee Megaw headed it back across the goal and it was turned in by Chris Duff from close range. Penarol weren’t finished though and with 15 minutes to go their efforts paid off when Darren Fletcher finished well after going up for a set piece. Some hesitant defending gave him time and space to slot home the equaliser. Penarol hearts though were broken with two minutes to go when David Chesney headed in a cross from the right to take all three points for the Ahoghill men. Saturday, September 12 - Irish Junior Cup, round one (1.30pm): Armagh City II v Abbeyview; Ahoghill Thistle v FC Penarol (Ahoghill); Cookstown Youth v Raceview; Carniny Amateurs v Loughgall Res (Showgrounds 7); Iveagh United v Waveney Swifts; Belfast Celtic v Braid United. firmus energy Division One (10.15am): All Saints OB v FC Antrim (Showgrounds 5); Ballykeel v Newpark Olympic (Ballykeel); Carniny Rangers v Glenravel (Wakehurst 1); FC Moylena v Harryville Homers (Forum); Riverdale v Clough Rangers (Wakehurst 2). firmus energy Division Two: Cloughmills v Cushendall; Holywell v Carnlough Swifts (Forum); Randalstown v Ahoghill Rovers; Sporting Ballymoney v Michelin; Seven Towers v Woodside (Showgrounds 4). firmus energy Division Three: St Comgalls v Atletico Antrim; Templepatrick v Northend & District (Forum); Ruby’s Rovers v Steadfast; Wakehurst Star v Southside Rangers (Dunfane 1).